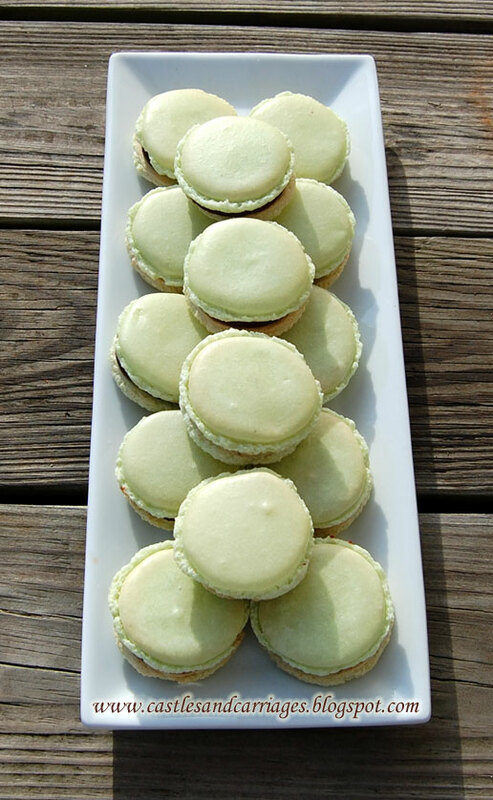 Making macarons is truly a labor of love. I make my own almond flour and sometimes I'll stay up late baking them after my little one goes to sleep. There are two methods of mixing the macaron meringue with almond flour and powdered sugar. The Italian method and the French method. 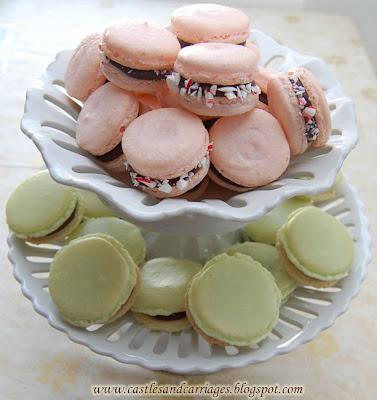 (The pink peppermint macarons were made using the Italian method and the green macarons were made using the French method). The Italian method combines a hot sugar syrup into the meringue before mixing it with the almond flour and powdered sugar. The advantages of this method is you don't have to wait very long for the macaron shells to harden before baking them in the oven (about 15 minutes in my kitchen!). I also love being able to have any amount of egg white. Using Syrup and Tang's ratio, I am able to calculate exactly how much almond flour and powdered sugar that I need every time. What I dislike about the Italian method is that's pretty hard for me to measure the temperature of the hot sugar syrup with my candy thermometer because of the scant amount of liquid. The other thing is you must be very careful in pouring the sugar syrup into the meringue or you could easily curdle the meringue. The French method combines granulated sugar into the meringue itself without making a hot sugar syrup. It's certainly easier to do it this way but you must wait an hour for the macarons to form their shell before baking. You have a specific amount of egg whites to use. If I happen to have an extra egg white then I need to find another recipe to use that up. I don't like waste! The best resource for learning about macarons and using the Italian method is Syrup and Tang's website found here. For the French method, I have a variety of sources. Martha Stewart. Tarlette. David Lebovitz. Several books (Laduree, I Love Macaron) to name a few. 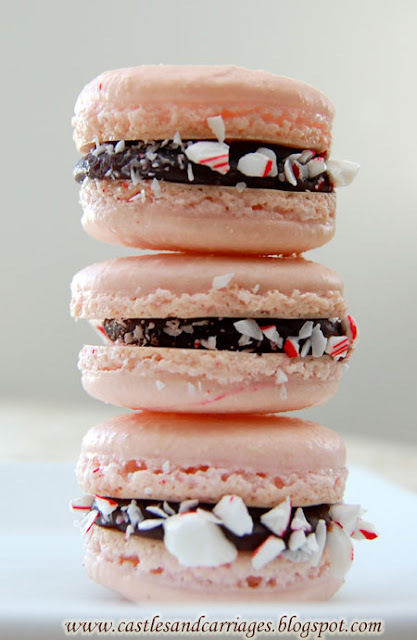 Use any of the above resources to make the macaron cookie and this peppermint ganache for filling. Heat the cream in a small saucepan. When the cream just begins to boil at the edges, remove from heat and add the chopped chocolate. Let sit one minute, then stir until smooth. Stir in the pieces of butter until smooth. Then add peppermint extract. My mouth just started to spontaniously water when I opened this post.... WOW!!!! Macarons yummmmmmmm! I labor of love to say the least! They look awesome! So pretty. Those are so pretty! 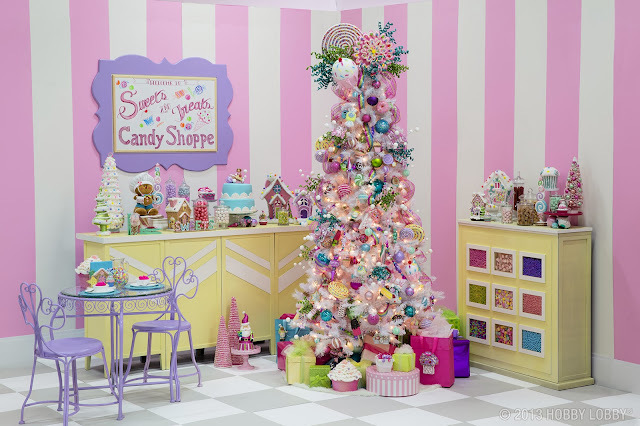 What a wonderful holiday treat! I featured these today! 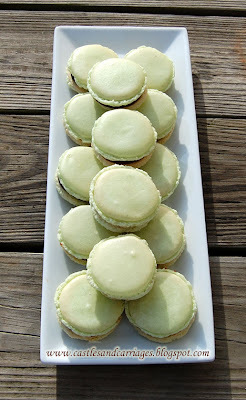 I was so happy to see them on my link party because I've been wanting to make macaroons for a while now! Yours are so so pretty too! I hope you link up again next week! These macarons look beautiful and delicious! You are really right about them being labors of love! perfect make for the holidays. Gotta buy macarons like these once Christmas rolls around, I know my family would love these.